First Energy did acknowledge a correlation between their impoundment and the offsite seeps when they met with the West Virginia Department of Environmental Protection (WVDEP) on October 27, 2010. We already have problems and worry that First Energy plans to dump more toxic ash near our homes. First Energy will be stacking geotubes, filled with toxic ash on the impoundment 62 feet high. We worry this additional ash will push more water towards the seeps on the WV side. The seeps coming from the Little Blue pond are contaminated. On August 24, 2010 the WVDEP did two water tests on seeps/springs, and the end result was high levels of cadmium in both tests. As I understand it, cadmium appears to be the largest single contributor to thyroid disease. I had thyroid cancer in 2001 and had my total thyroid removed. My wife Debbie has a lump on her thyroid that the Doctor found in 2009. The Doctor keeps a close eye on it. My neighbor around 30years of age has a lump on his thyroid and a tumor on his spine and another neighbor around 70 years of age had thyroid cancer and prostrate cancer in 2008. My Doctor told me that thyroid cancer is more common in women than men. We have found out there are ten monitoring wells at Little Blue that have high levels of arsenic, and no one told us about them. We found that out after reviewing public documents. Even more troubling is the fact that on January 25, 2006 the WVDEP turned our rights over to the Pennsylvania Department of Environmental Protection (PADEP). This is West Virginia. This land does not belong to Pennsylvania. I have pictures of the dam from 1996 and they show the dam full of strange, blue water … today, there is no water. Where did all this water go? We believe it has been discharged to area drinking water. We don’t believe we can depend on the WVDEP or PADEP to protect our health from the known toxic metals found in coal ash. We believe the only way to get health protections from toxic coal ash are through federal rules – and require the states to enforce those protections. I have concerns about my wife’s health and my health because I have grown a family garden on my land for the past 34 years and have fed my children and my grandchildren from it. I have been honored to serve my country as a Yeomen 3rd Class aboard the USS John S. McCain (DDG-36) in the Navy. Now I come to Washington, DC this week to speak to members of Congress and the administration asking for strong federal protections for my family and community. We are only on earth one time. Please help us keep it safe and make a better place to live for us and our grandchildren. We understand jobs are important – but no one should have to chose jobs OR health. We need and deserve both. UPDATED: It’s worth noting that both Rep.Nick J. Rahall, D-W.Va., and Rep. Shelley Moore Capito, R-W.Va., are co-sponsors of McKinley’s bill. 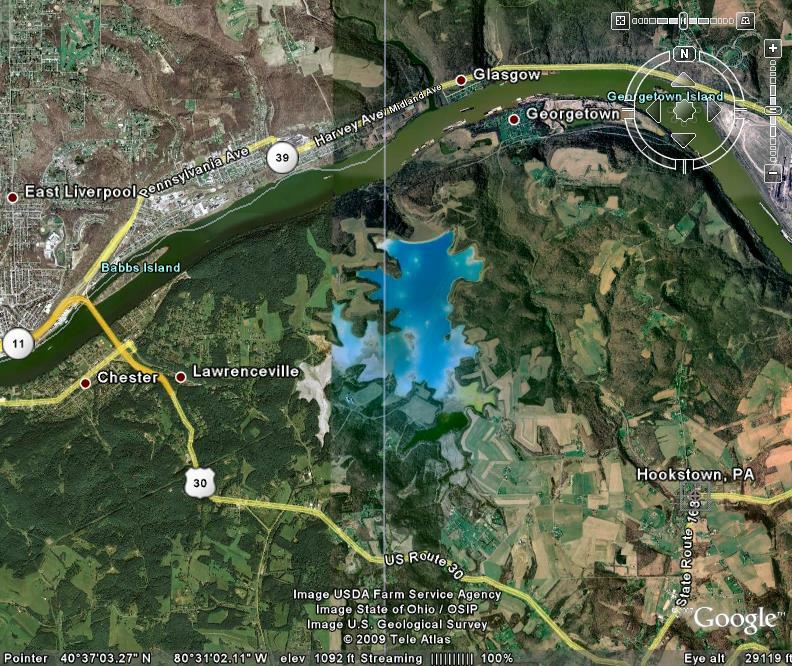 I notice your aerial image of Little Blue looks much like the one from Google maps. You might be interested to look at the aerial image from Mapquest. It is more recent. The changes in the water are apparent. You may also want to note some differences in the dam. Citizens for Recycling First is an organization of approximately 2,000 individuals working in the coal ash recycling industry. We are not affiliated with coal mining companies or utilities. We are the people who develop markets for recycled coal ash and use it in making products. We would like to point out a couple of misconceptions about coal ash that are included in this blog entry. First, Rep. McKinley’s bill would NOT block EPA from finalizing new coal ash disposal rules. It would only prevent EPA from doing so under the Subtitle C “hazardous waste” section of the law. EPA already has a proposal on the table for regulating coal ash disposal under the non-hazardous section of the law. The actual landfill engineering requirements in that proposal are the same as the requirements of the “hazardous waste” proposal. EPA can finalize those requirements even if the McKinley bill is approved. Second, coal ash is NOT “toxic.” The careless repetition of this label is starting to destroy one of the most beneficial recycling efforts in America. Coal ash contains trace amounts of metals, just like most materials you encounter in everyday life. (For example: compact fluorescent light bulbs, dental fillings, daily multivitamin pills, etc.) The levels of metals in coal ash are similar to or lower than the metals present in the materials coal ash replaces when it is recycled. Those metals are only “toxic” if they have a way to get out of the ash and into you in sufficient quantities to cause harm. The problem is that less than half the coal ash produced gets incorporated into things like concrete. The hazardous waste designation gives EPA enforcement power to protect the health of people who live near coal ash impoundments. I encourage people to take a look at this piece by the Center for Public Integrity http://www.publicintegrity.org/blog/entry/2377/, and click through to look at the report of their investigation. If it’s accurate that your members are people who have a *financial interest* in the use of coal ash in things like concrete, I think it’s misleading to call the organization “Citizens” for Recycling First. Coal combustion waste IS toxic when it is dumped in unlined surface mines and impoundments. Near our home, arsenic has leached into local streams at levels almost 300 times above the WV State water quality standards (WQS) from surface mines where thousands of tons of ash waste have been dumped. A local well had manganese levels 6 times above the monthly limit. At another nearby site, selenium was measured at 120 times WQS, while thalium was at 140 times WQS. Fish downstream of ash dumps had selenium concentrations in their tissues of up to 6 times greater than the EPA criterion. These are just a few examples from WV based on data collected by WVDEP. Many studies in many states have documented that heavy metals and other contaminants leach from the ash into surface and ground water and cause severe impacts to environmental and human health. Proper recycling and disposal of these toxic wastes will not happen without strong federal regulation, i.e. subtitle C. Subtitle C will allow recycling to continue AND it will stop the indiscriminate dumping. “They’re vitamins!” sorry for the spelling error. Recycling certainly is the best way to go and should be (at least) encouraged rather than dumping. Handled properly, the toxins in coal ash are not as problematic. Handled improperly, it is indeed a toxic waste. Combining coal ash with ground water is the worst possible scenario. Our legislators need to be educated about this cold, hard fact.